The measure of any good business school is the success and satisfaction of its graduates—and China’s Cheung Kong Graduate School of Business (CKGSB) has certainly excelled in this area. More than half of CKGSB alumni work at CEO or chairman level, and collectively they lead one in five of China’s most valuable brands. Many head up their own businesses, and altogether CKGSB alumni influence more than $1 trillion in annual revenue. This makes for a formidable alumni network, offering MBA students at CKGSB the opportunity to extend their business reach across industries and international boundaries, an essential for any prospective MBA student looking for an international career. We’ve rounded up six of CKGSB’s most influential alumni and their profiles below. Jack Ma co-founded the multinational tech conglomerate the Alibaba Group in 1995, and acts as its executive chairman to this day. In Forbes’s 2018 list of the richest people on Earth, Jack Ma came in at number 17, with a net worth of $42 billion. He attended CKGSB in 2006 for the school’s Global CEO program, an elite course which brings top-level Chinese executives into conversation with world-leading scholars to discuss pressing topics like sustainability and next generation leadership. Fu Chengyu is the former chairman of China Petroleum and Chemical Corp, otherwise known as Sinopec, the largest refiner in Asia. He took up his chairmanship in 2011, but previously to that he had worked in top-level management at the China National Offshore Oil Corporation (CNOOC), overseeing joint ventures with major international petroleum companies like Texaco and Shell. His efforts paid off—CNOOC saw a fivefold profit increase during his tenure in management. Like Jack Ma, Fu Chengyu attended the Cheung Kong Graduate School of Business’s CEO program. Li Dongsheng founded TCL Corporation in 1981 under the brand name TTK. Since his initial start of making knock-off TDK cassette tapes, TCL has grown to become a multinational electronics company that designs, develops, manufactures, and sells tech products from mobile phones to refrigerators. As well as his business career, Li Dongsheng has had a significant political presence in China, serving as a representative of the 10th, 11th, and 12th National People’s Congress. Chen Yidan is the co-founder of Tencent Holdings Limited, a multinational investment conglomerate established in 1998. As well as being a top businessman, Chen has also been active as a philanthropist: he has led the Tencent Charity Foundation since its establishment in 2006, even after his professional retirement from the company in 2013. One of his other significant philanthropic ventures is the Yidan Prize, established by a $2.5 billion donation from the businessman in 2016. The prize is awarded to two people annually, rewarding excellence in education development and bestowing a grant for education research. Chen enrolled at CKGSB for their Business Scholars Program (DBA), which aims at developing management scholars with a global outlook. Known as China’s answer to Warren Buffett, Guo Guangchang (pictured left) co-founded international investment company Fosun in 1998, and now serves as its chairman. 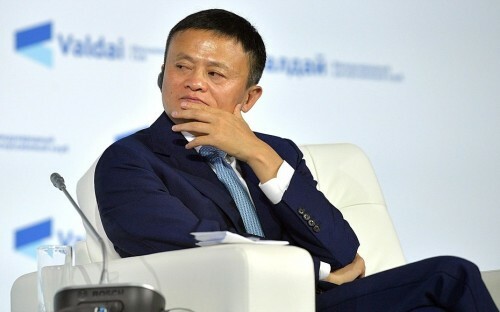 According to Forbes’s list, he is the 19th richest man in China, with a net worth of $9 billion. He studied at CKGSB in the 2006 CEO Class, alongside Jack Ma. Perhaps it was on Guo’s recommendation that his colleague at Fosun, CEO Liang Xinjun (pictured right), also studied at CKGSB the following year, enrolling in the school’s Executive MBA program. Cindy Mi is perhaps CKGSB's most successful MBA alumna. Her disruptive EdTech startup, VIPKID, which matches Chinese students with tutors in North America, has attracted huge investors since its launch in 2013, including from other alumni on this list—Tencent Holdings have invested in Cindy's company, as well as Jack Ma's Yunfeng Capital. After completing an MBA at CKGSB, Cindy developed her startup in the Chuang Community, a CKGSB incubator that was founded by the school's associate dean Liu Jing and a group of CKGSB alumni. Now, VIPKID is valued upwards of $1.5 billion.